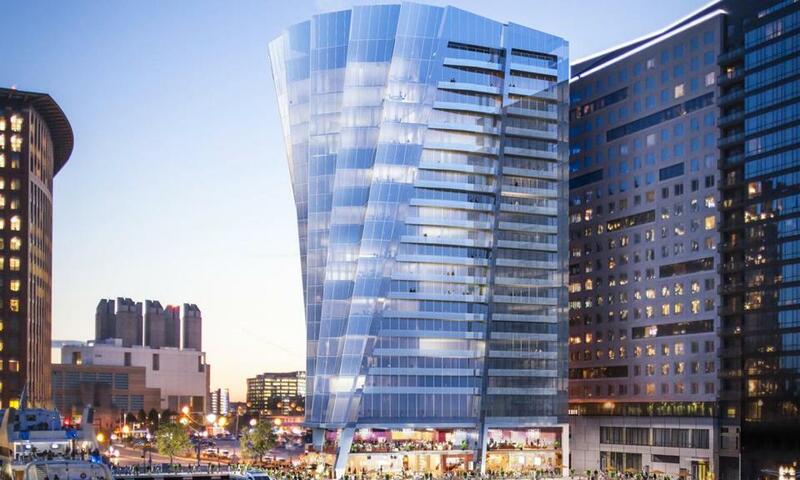 An architect’s rendering shows the 22-story residential building proposed by Jon Cronin on the South Boston waterfront. Restaurateur Jon Cronin wants to become a big player in the South Boston waterfront’s booming development scene with his plans for a 22-story residential high-rise overlooking the harbor. But first, Cronin will have to get past a Boston-based environmental group that’s pledging to litigate if state officials approve a change in development parameters for the area. The Conservation Law Foundation’s claim: too much of a key waterfront lot would be taken up by the building, limiting the potential for public access and setting a bad precedent for shoreline development in the city. 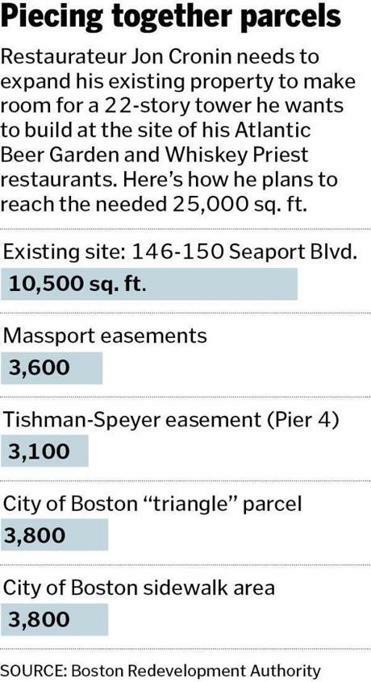 Cronin has powerful allies in his quest to convert his Atlantic Beer Garden and Whiskey Priest restaurants into a luxury condo tower. The Walsh administration is pursuing the change on Cronin’s behalf, and many Southie politicians and businesspeople have signaled their support to the state environmental officials who are reviewing the city’s request. But the Conservation Law Foundation represents a formidable foe, given its platoon of attorneys and the ease in which it can engage in a legal war. Campbell is referring to an 1866 state law, one based on a centuries-old legal doctrine that the sea and shoreline should belong to the public and not to one particular person. This is the law at the heart of Somerville’s recent battle with Wynn Resorts over its proposed casino in Everett, and it’s a big reason why developer Don Chiofaro has not yet been able to turn the Boston Harbor Garage into a two-tower complex. In Cronin’s case, city officials want state permission to update their harbor plan for that part of the waterfront to allow for a much larger building with condos instead of two restaurants. State officials use these plans to weigh whether a project’s proposed public benefits are enough to help offset its impact. Cronin acquired the property a decade ago and replaced the two restaurants there with his own concepts. At the time, the South Boston waterfront was still largely a sea of parking lots, its renaissance only starting to take shape. Flash forward to today: Most of the lots have been built on or will soon be, with towers dwarfing Cronin’s two restaurants. He wants to capitalize on the wave of construction all around him with the $260 million project, his largest development so far. The project, which is scheduled to be discussed by the Boston Redevelopment Authority on Thursday, would include 124 condos as well as two stories of restaurant space on the bottom floors. To pull it off, Cronin is working on deals with three neighboring property owners including the city and the Massachusetts Port Authority, to expand the site from 10,500 square feet to roughly 25,000, according to numbers included in the city’s request to the state. Cronin, for example, needs to obtain a small city-owned parcel, along with air rights over a city sidewalk. Cronin wants considerably more lot coverage than the 50-percent maximum allowed under the state tidelands law — exactly how much more depends on whether a proposed deck over the water is included in the calculations. State officials can, and often do, waive thresholds imposed by the law, as long as developers come up with an appropriate level of public benefits. In Cronin’s case, he plans to spend at least $10 million to build a missing piece of the Harborwalk at the site. He has also proposed giving $1.5 million to the Martin Richard memorial park to be built about a half mile away, next to the Children’s Museum. And he plans to donate $250,000 for the construction of civic space in the nearby Envoy Hotel. 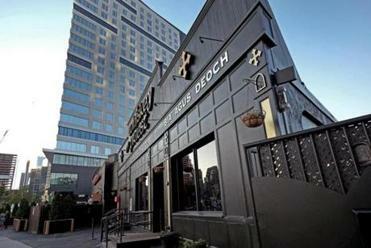 The Conservation Law Foundation is planning to sue the developer of a 22-story tower where the Whiskey Priest and Atlantic Beer Garden are located. The Conservation Law Foundation, among other points, argues that the spirit of the state law suggests such benefits should take place at the site, not blocks away. More than 2,100 letters of support for Cronin’s project were filed last month with the state Department of Environmental Protection. A spokesman for Cronin said most of those letters were collected by “the many groups and businesses in the community who support this project” after Cronin distributed petitions. The Conservation Law Foundation argues that without the additional city land or the new 12-foot-wide Harborwalk connection included in the calculations, the tower would take over nearly all of the site’s ground space, clearly violating the state law. BRA waterfront planner Rich McGuinness defended his agency’s decision to accommodate Cronin with the harbor plan amendment. The Seaport area has changed dramatically since the plan was written 16 years ago, McGuinness said. He also said there’s not enough room on the site for mitigation measures that could be used to offset the tidelands requirements, so it makes sense to count improvements near the Children’s Museum. The final decision rests in the hands of Matthew Beaton, Governor Charlie Baker’s energy and environmental affairs secretary. Beaton is expected to decide this fall. Matthew Kiefer, a land-use lawyer with Goulston & Storrs, said he understands why the Conservation Law Foundation worries about the precedent this project might set.